True stories become legends and legends are compressed via symbols into myths. 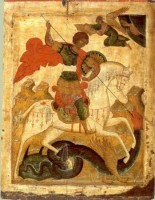 The St. George of myth was a knight in armor who fought a dragon to save a princess. The real George never saw a dragon nor did he rescue a princess in distress. We are not even sure he had a horse, possessed a sword, or was a soldier. It is possible he was a farmer – the name “George” means tiller of the soil, which explains why St. George is a patron saint of agriculture, herds, flocks and shepherds. A Christian convert who was born late in the third century after Christ and died early in the fourth century, George was one of the victims of the anti-Christian persecution ordered by the Emperor Diocletian that began in February of the year 303. Churches were destroyed and biblical texts burned. All Roman subjects were ordered to make ritual sacrifices to Rome’s gods. Those who refused risked loss of property and severe punishment. Many were sent into exile as slave laborers in quarries and mines in Egypt and Palestine. Thousands were tortured and many executed. Finally in 311 the attack ended. With Diocletian in retirement and the emperor Galerius critically ill and close to death, Galerius published an edict of toleration allowing Christians to restore their places of worship and to worship in their own way without interference, provided they did nothing to disturb the peace. What made George a saint among saints was the fearless manner in which he proclaimed his faith during a period of persecution when many other Christians were hoping not to be noticed. According to one ancient account, George went to a public square and announced, “All the gentile gods are devils. My God made the heavens and is the true God.” For this George was arrested, tortured and finally beheaded. The probable date of his martyrdom is April 23, 303, in the town of Diospolis, later known as Lydda, in Asia Minor – Turkey as it is known today. His courageous witness led to the conversion of many and gave renewed courage to others already baptized. 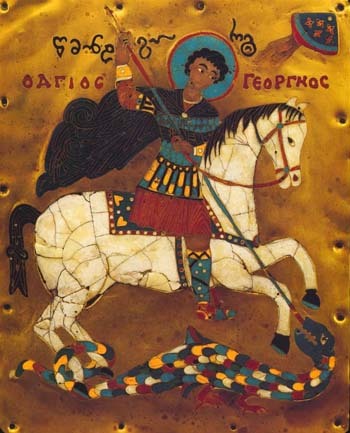 In the oldest icons of St. George, he is shown dressed as a soldier and holding the cross of martyrdom. It was only in later centuries that the dragon legend emerged. It has been told in many variations, but in its most popular form it concerns a dragon living in a lake who was worshiped by the unbaptized local people, who in their fear sacrificed their children to appease the creature. Finally it was the turn of the king’s daughter, Elizabeth, to be sacrificed. While going toward the dragon to meet her doom, Saint George appeared riding a white horse. 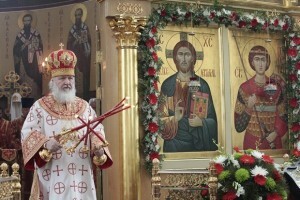 He prayed to the Father, Son and Holy Spirit, then transfixed the dragon with his lance. Afterward Elizabeth led the vanquished creature into the city. According to the Legenda Aurea written by Blessed James de Voragine, the wounded dragon followed Elizabeth “as if it had been a meek beast and debonair.” Refusing a reward of treasure, George called on the local people to be baptized. The king agreed, also promising to maintain churches, honor the clergy, faithfully attend religious services, and show compassion to the poor.